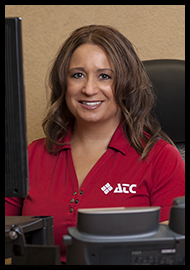 This smiling, fun-loving, gregarious face has been with ATC since 2009. Beth Ann loves interacting with people from all walks of life, and is a master of social jiu-jitsu. Beth Ann brought cellular experience to the ATC table, and has been charming eveyone who meets her since then. When our “Charismatic Communicator” is not attentively taking care of customers, you might find her boating, jet skiing, or any outdoor activity surrounded by family and friends. Beth Ann loves trying new things (except Karaoke), and enjoys learning about her Italian roots. We’re delighted to have Beth Ann on our ATC team!